Feel like somebody hit the brakes on your Diesel Brothers cravings? Discover how you can keep the gas going with this rip-roaring ride behind the scenes of Discovery Channel’s popular series Diesel Brothers—read by the authors! In the world of monster trucks, no one builds bigger and more extreme rides—and has more fun in the process—than Heavy D, Diesel Dave, and their crew at DieselSellerz. Their larger-than-life creations and awesome truck giveaways are legendary, but for those less fortunate who haven’t had the opportunity to experience a Bros’ souped-up truck, this thrill-ride of a book is the next best thing. 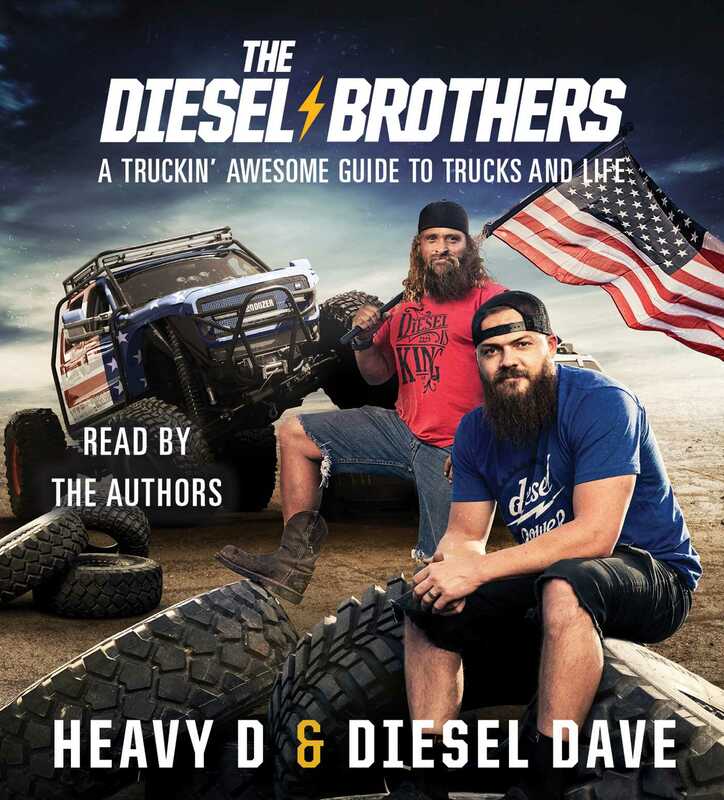 Learn the epic and inspirational stories behind Heavy D and Diesel Dave’s business and personal lives, from the guys’ first meeting, to their early adventures building DieselSellerz, to their successful business venture with Redbeard, Muscle, and the rest of the fearless staff. In addition to learning about the Bros’ two-year Mormon missions, humble beginnings, and world travels, you’ll also get the unforgettable details of their hilarious, most well-known pranks, and the remarkable stories behind the personalities that have made Diesel Brothers one of the fastest growing and most popular reality TV shows. But wait—there’s more! The book is chock full of essential advice for anyone who’d like to get in on the action. Whether you’re a die-hard monster truck fan or just looking for inspiration to upgrade that piece of junk in your garage, Heavy D and his crew are here to show you how it’s done. You’ll learn how to find the best bargain in the junkyard, how to play hardball with tough-talking dealers, and how to turn that sad sack heap of parts into a badass diesel vehicle. What are you waiting for? Get out there and let diesel freedom ring! Dave Sparks (Heavy D) is an American entrepreneur, custom vehicle builder, and social media personality from Salt Lake City, Utah. In 2008, he hired his first employee, his best friend “Diesel Dave” Kiley, to help him run the equipment at his construction business. He picked up his dealer’s license, opened a small used car lot, and started working to build his dream company, DieselSellerz. His business has grown and so has his family—he met the girl of his dreams and has two adorable kids. Dave Kiley (Diesel Dave) first met Dave Sparks (Heavy D) at a church event for young singles and Heavy D invited Diesel to the lake with friends in his pickup. Little did they know that this would lead to a successful career in selling and building diesel trucks at DieselSellerz. Diesel Dave’s passion runs rich in his blood. He wants nothing more than to put the hammer down and spread torque, horsepower, and diesel joy to all people through the land—letting Diesel freedom ring!